Inspire yourself or someone you care for with a personal message, translated into a graceful Chinese symbol. This round sterling slier key ring attaches easily to a handbag, briefcase, golf bag, or backpack and makes a wonderful gift to keep or give. 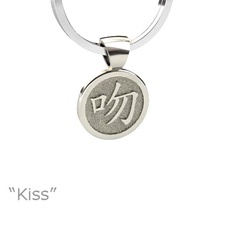 Personalization: A single Chinese Character fits on each key ring fob. A word or phrase often translates into multiple characters, so please check prior to ordering.